I just want someone else to cook dinner. I would LOVE to not have to make any meal that day, and get to sleep in. A solid week of free childcare so I can clean and organize every inch of my house. A day of no kids to organize my craft space... that would be awesome. A day of helping me on a project without complaining. I have 2 DIY projects that need at least a second person that have been on my list for far too long. I agree...that not having to cook would be great. I would really, really love a gift certificate to a day spa...I never take the time to do that kind of thing for myself, and unless somebody gives me a certificate, I won't go. A new outfit or rather a gift certificate so I can pick out a new outfit. Individual trifle bowls for parties! I've been eyeing them up for months. Essential oils were mentioned by several moms! I would love some new makeup, you know, the good stuff...I would love to receive some new mineral makeup. Now, THAT is a Mother's Day gift my husband would ultimately benefit from too! Ryobi One+ 18v brad nailer, circular saw w/ rip cut jig, jig saw, and a date night with the hubby sans kiddos. A new tote... something upcycled. My Guys got me a new pink beach cruiser for an early Mother's Day present that I am enjoying this week on the beach. Just one thing? The KitchenAid Stand Mixer I've been promised since I got married 5 years ago. Oh, and it's gotta come in hot watermelon pink. 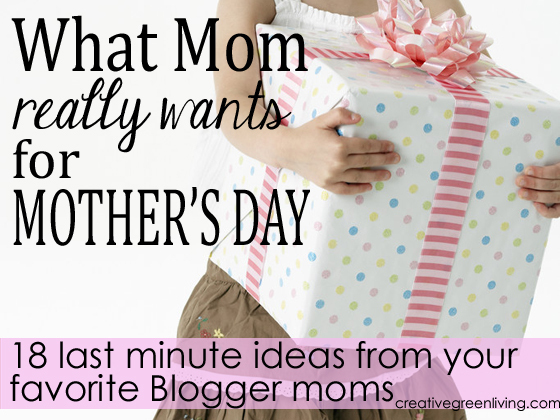 A Vitamix blender was also listed by several bloggers as a top Mother's Day pick. Doing last minute shopping? Use Amazon Prime and their free two day shipping! Click the banner below to sign up for a FREE 30 day trial of Amazon Prime and get all your last minute gift shopping done online!